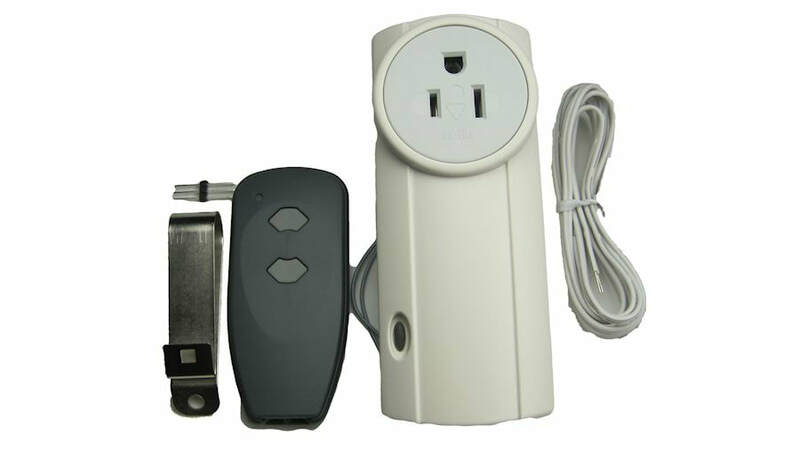 Finding a replacement remote for your Marantec garage door opener can be a little difficult sometimes so we're going to cover a couple of ways that you can use to make sure that you get the correct replacement remote for your Marantec opener. First we'll cover a little bit of history concerning the Marantec garage door operators. Marantec brought their German technology to North America in 1997 and set up a manufacturing plant in Gurnee, Illinois. Some of the first models they introduced were from the Mac-Lift III line and consisted of the Deluxe 2005 and Elite 2007. In 2003 they introduced the M-Line models and the Q-Line models followed. They were in production until around 2008 when the M-Line EOS models came out which were sold until the new Synergy Series models were introduced in 2017. We bring this up because over the past 20+ years that these openers have been around there have been four different radio frequencies that the remotes used. And it's important that the remote used has the same frequency as the radio receiver or they won't communicate and the remote won't work. So finding the correct remote is important. The early models (Mac-Lift Deluxe2005, Mac-Lift Elite2007, and some of the M-Line M4500 & M-Line 4700) used a 40MHz, 390MHz or 433MHz frequency radio receiver. All of these frequencies are no longer in use and the remotes for them were discontinued. "Universal" types of remotes that you may see at the big box stores will NOT work with these frequency of receivers. 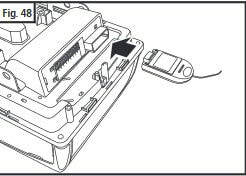 If you know that you have a 40MHz, 390MHz or 433MHz frequency receiver (or remote) on your Marantec opener then you'll need to install a new radio receiver and remote conversion kit. Once you hook the conversion kit up to the opener and program the remote to the new receiver you'll be back in business. You can find more info about the 75424 Plug-in Radio Receiver Set here. If you're not sure what frequency of radio receiver you have then continue reading below. The easiest way to determine what remote you need for your Marantec opener is to look at the back of your remote. You'll find the model number and the radio frequency printed on the back of the remote. If you don't have a remote or you can't read the info on the back of the remote then skip ahead to the next tip (Check Your Radio Receiver) otherwise keep reading. If your remote has any of the frequencies listed below printed on the back of it then you'll need to install a new 75424 Plug-in Radio Receiver Set because remotes are not available any longer in those frequencies. The radio receiver set includes a new radio receiver and remote. Additional remotes and a keyless entry can be added to the new plug-in radio receiver. If your remote has any of the model numbers listed below printed on the back of it then you'll need to install a new 75424 Plug-in Radio Receiver Set which includes a new radio receiver and remote because replacement remotes are no longer available in those frequencies. Now if your remote has 315MHz frequency printed on it or is one of the listed models below then you are able to purchase a replacement remote since the current frequency of the Marantec remotes is 315MHz. 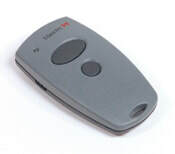 If you have one of the 315MHz frequency remotes listed above then any of the current Marantec remotes will be compatible with your opener: 382 Digital 2-button Remote, 384 Digital 4-button Remote and M3-3313 3-button Keychain Remote. *NOTE: if you have one of the older "ML" 315MHz frequency remotes listed above then you'll also need the Old-to-New Programming Cable found here to transfer the code from the old remote to the new remote. The "M3" remotes listed above use the New Program Jumper to transfer the code and it is included with a new remotes. If you don't have any existing remotes or can't read the info on the remotes then you'll need to get the frequency the opener uses from the radio receiver. The modular radio receiver is approximately 3"x3" in size, usually a grayish color and has about an 18" long antenna wire coming out of it. The receiver is in a slot on top of the powerhead (motor unit). To read the info printed on the modular receiver pull the radio receiver out of the slot and write down the frequency printed on it. Once you've done that push the receiver back into the slot. If the frequency you wrote down is 40MHz, 390MHz or 433MHz then you'll need to install a new 75424 Plug-in Radio Receiver Set which includes a new radio receiver and remote because remotes are not available any longer in those frequencies. If the frequency you wrote down is 315MHz then any of the current Marantec remotes will be compatible with your opener: 382 Digital 2-button Remote, 384 Digital 4-button Remote and M3-3313 3-button Keychain Remote. You can also measure the overall length of the antenna wire coming out of the modular radio receiver and check it against what you've written down. A 433MHz frequency receiver will have an antenna wire about 7" long, a 390MHz receiver will be 9" long, a 40MHz receiver around 48" long and a 315MHz receiver will be about 13" long. Only Marantec brand remotes will work with the Marantec openers. Universal remotes won't work with Marantec openers. The New Program Jumper that is used to transfer the code from one of the new remotes to another newer style remote comes with the purchase of a new remote. If you have an older ML model 315MHz remote then you'll need to purchase the Old-to-New Program Cable separately. If you have a question feel free to use the email address below and we'll get back to you.